Every new year, we get a few Mondays off school. We usually plan small weekend trips - usually Tahoe or south a little to Santa Cruz, but this year we’ve stayed local. We have a big trip planned for spring break, so we’re holding off on the wanderlust for now, and appreciating our own backyard. Yesterday we realized it’s been forever since we’ve done Lands End and it was time. :) We’ve always parked by the Sutro Baths when we’ve gone (I LOVE the Sutro Baths), but since our kids tire before we finish the whole loop (it’s between 3.5 & 4 miles total, and it takes a lot of extra time when you have kids who like to veer off the path and spend plenty of time climbing rocks at the beach), we decided to start on the other side of the loop near Seacliff & down the hill from Legion of Honor. HERE is the spot on the map. If you’re in town for only a short bit and all you want are quick pics of views and then to move on to something else, the views are RIGHT there. Walk a few steps and get more views. All the way around it’s a new angle of the pretty bridge. Jack kept up pretty well. The hike is honestly not hard for anyone but Jack, and he’s three so that feels fair. He did great getting there, but back to the car was a trek with a little guy going uphill and up stairs two hours past his nap. I love how lush and green it is right now. There were puddles and areas where it was slightly muddy, but not bad considering how insanely rainy it’s been all month! Sunshine in the forecast for the week and I can already feel all of our moods getting collectively brighter. I love rain in moderation, but since our state needs rain in bulk, I’m doing my best not to complain about it… definitely appreciating every bit of sun when it does come out! Ate some snacks by the rocks, then ventured down to the beach. It’s not like a “lay-out and sunbathe” beach… not that any SF beaches really are except on those heat wave weeks when they’re packed out. This one is mostly rocks. We had a competition boys vs. girls to build the best rock towers. Girls won easily, of course. Sophie wanted to climb on one of the massive boulders at the ocean, but we restricted the kids to a nice giant rock right beside it where they could see thousands of mussels and massive starfish in the water as the waves crashed. Allll those black shells on the rocks are mussels. It’s so crazy how many are just clustered there! Sophie was first to get her feet accidentally wet, but Maggie got it BAD- up to her ankles. She wasn’t thrilled about it, but honestly, she was pretty chill considering how freezing her feet were the whole walk back. I’m resisting posting the shot of her adorable sad face when she realized how soaked she got. It’s funny because when I told people I was pregnant with my first, second, and third child, we got the question throughout, “when are you going to move out of the city?” I know we have postage stamp backyards, and we have some definite gritty sidewalks and everything else, but ohhhhh, we are finding it is a GOOD place to raise a family. So many open spaces and beautiful history and everything else to explore, and yesterday reminded us again. Verdict on the day: 5/5 of us had fun and that’s a good percentage. Total time out there: about 2.5ish hours. Total mileage: only about 3 miles. Total Band-Aids used: None (it’s a miracle!)! We’ll come back to Lands End Trail again sooner rather than later. :) And when Jack is a little bigger, I want to do the full loop. I’m a person who loves and thrives on traditions and experiences. There isn’t much more that excites me than to travel to new places, have new experiences, and create memories. I haven’t been to the ballet since I was a child on a field trip. Several friends go to The Nutcracker every year, but I’ve only briefly considered it until this year. We were SO honored to be invited to opening night at the SF Ballet and share about our experience, and now I want to attend every.single.year. The performance we attended was a Passport Performance, which means that there are additional activities for children. The first 500 children receive a darling stuffed bear upon arrival, then are treated to SmashMallow snacks before the performance, and Miette shortbread cookies at intermission (both favorites!). They receive a passport book with stamps to acquire through visiting activities throughout the Opera House. As my girls ran up the stairs, I was able to see the incredible Opera House adorned in lights and garland and stunning Christmas trees on every level. They took photos at photo booths, learned history, and had the opportunity to see ballet pieces up close. The highlight of the Passport experience was having the privilege of holding authentic ballet slippers (much heavier than they look! ), and trying on the REAL tutus the ballerinas wear. There are booster seats for children to use during the performance, and both of mine needed them (shorties!). The views from our seats were perfection, and the show was magic. I had no idea what I have been missing all these years not attending. The elegance of movement, and the stunning costume design was absolutely breathtaking. We stayed the entire time. I wasn’t sure how my Maggie would do since it was wayyy past her bedtime. The show started at 7:30 (also past her bedtime!) and lasted until 9:30. I wouldn’t recommend it for children younger than six because it IS long and late, and I even had to shhh my little talker when she made some observations. She loved it so much that even when her eyes were heavy and her head started resting on the back of her chair, she said she definitely did not want to leave early. Sophie was engaged and enthralled the entire time (so was I!). We could not recommend the experience more. I am already looking forward to taking the girls in 2019 to experience the magic again. 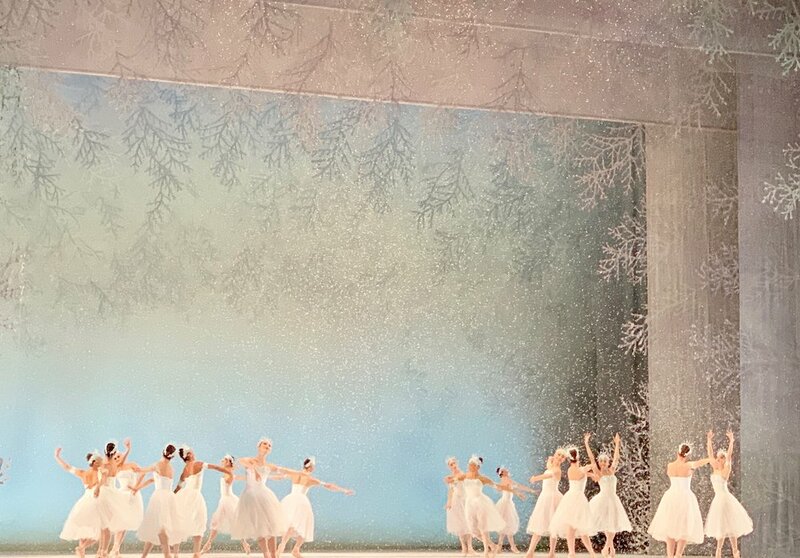 The Nutcracker runs from now until December 29! *Tickets were complimentary in exchange for a review. All opinions are my own. We LOVED the entire experiences. Ahh, Tutu School, how I love you. When Sophie was 2, she wanted to be a ballerina. We enrolled her in a local (unnamed) ballet school and did NOT enjoy it. She had sparkle tights, and the school required proper pink tights and black leotards only-- for TWO-YEAR-OLDS. It was strict and classes were cancelled on whims, and our experience was entirely unpleasant... We needed to switch things up asap. I called around and talked to THE sweetest lady over at Tutu School and was basically sold over the phone by what a stark contrast she was to what I currently had.. but still, I wanted to see for myself if it was that good. A totally free, no-strings-attached trial class is offered to any child who wants to get their ballet feet wet at Tutu School. Sophie attended her trial class in sparkly tights and pink slippers, and felt like a princess ballerina from the start. Tutu School gives girls their freedom to express their love for twirling, sparkle, fancy, AND get their start in true ballet fundamentals during their classes. Until children are three, the classes are "mommy (or caregiver) & me," meaning I was also pointing my toes and learning to tendu and pique with my girls (I was sore after more classes than one, ha!). It really IS that good. Maggie obviously followed closely behind-- as soon as she was old enough to join, she wanted to get in on dancing her little heart out weekly. Five years later, and both girls are still enrolled in Tutu School. It is THE BEST. They love it with all their heart, and it is their first choice of extracurricular every year. The format adjusts as the little dancers get older. Toddlers have far more free dancing and story time, and prep girls have more time at the bar learning proper balance, technique, and form. Tutu School also offers camps and PARTIES. I recently attended a party (actually was honored to co-host! ), and they truly make everything they touch special at these parties. The children are engaged with crafting, twirling, and enjoying their refreshments, and the adults can mingle and enjoy themselves and watching their children's eyes shine. Side note-- check out those gorgeous plates and cups created by my friends from Harlow and Grey! So pretty! I cannot keep talking about Tutu School without introducing you to the story behind the operation. Tutu School started on Bay Street in 2008 by my friend Genevieve. She is an amazing woman-- a mother of three boys (including twins!! ), a former dancer and a teacher. She recognized that little dancers ages 8 and younger have beautiful imaginations and an appreciation for magical moments, but rarely are ballet classes offered that truly embrace the dreamy ballet experience. She opened the doors to her San Francisco and Larkspur locations, and two schools have seen countless children come through their programs, wearing tutus of all colors, rainbow tights to sparkly black tights, fancy accessories, and tiaras on a Tuesday morning. It's all allowed and even encouraged. Genevieve has had so much positive feedback and interest in her school that she was motivated to create a franchising opportunity for Tutu School. Obviously the franchising concept was hugely popular from its start-- it's a business which has appealed especially to mothers who love the idea of taking ownership of a beautiful program, but who don't necessarily want to start at square one. The franchises have taken off, and there are now 14 Tutu School locations! What started as a simple dream of owning a small business is truly blooming into a cross-country operation. I'm so inspired by Genevieve- who also happens to basically be the same age as me. She put her dreams into action and has created something so beautiful... for herself, for little dancers and their families, and now for other entrepreneurs. Genevieve would like to offer the most amazing giveaway today to my readers (I've never wished to be a winner in my own giveaway quite so much, haha! ): a Tutu Du Monde dress for a little ballerina, size 4-5, with a crown and a wand. If you'd like more info on franchising, please connect with Genevieve HERE. This is the look of a girl who is confident in the kitchen. WHY is Maggie so confident in the kitchen, you ask? I joked when I signed her up for her first class that I want to train my kids to be amazing chefs so that by age 10 they can do all the family cooking. She was 2, and it seemed like a great extracurricular. Before the session even ended, I signed her up for another class... then another. Many many bus rides and beautiful walks around Ghiradelli square later, I'm finally writing about it... and based on how much and how often Maggie wants to cook with me, I'm actually starting to think my jokes may come true! Peekadoodle's location is IN Ghiradelli Square. Feels like a postcard. I love fresh air, and spent so much of my time during her classes taking walks around municipal pier, enjoying the waterfront and quiet foggy mornings in a peaceful neighborhood. I would buzz to get into Peekadoodle, drop Maggie with her adorable cooking teacher, then grab a cup of hot coffee in the Peekadoodle cafe... which I actually enjoyed HOT. What? I know. Normally my cups of coffee are lukewarm (or I just throw ice cubes in and embrace the cold coffee) because I'm chasing my kids and hustlin' around home or around the city. Peekadoodle gave me a moment every week to breathe and relax. Jack was tiny during Maggie's most recent session, so he sometimes would sleep and sometimes would look around and want to play in the section devoted to babies. Toddlers stayed on their side of the play structures, and babies safely can maneuver and scoot around their play area. Any tasted toys get put in a bucket and cleaned regularly, so we could be assured that babies are avoiding extra germs. Maggie currently knows how to safely chop, how to mix without the mixtures flying out of the bowl, how to crack an egg (without any shells), and most importantly, she understands how delicious healthy recipes can be. All because of her classes. The kids start class by washing their hands, putting their tiny adorable aprons on, and sitting down to prep their food. This is the bulk of the class time, but all the ingredients are prepped and ready for them, so it doesn't take longer than necessary. Watching the teachers work to teach groups of toddlers and pre-schoolers the basic cooking skills showed me that I can feel confident teaching my own children at home too. A huge aspect of not going totally crazy while doing so is PREP. Teachers have ingredients set aside but measured, and the kids can pour. As they get more experience they get to have more hands-on responsibility. When the food goes in the oven, the kids have story time and letter practice, and they get to run around (in butterfly wings if they want!) outside. Can I just tell you (in case the pictures don't speak for themselves): Maggie thrived in her class. She would leave full of chatter and excitement. When we'd go to the grocery store, she would ask me to buy the ingredients from the recipes she made in class to make them for Brian and Sophie too. She could rattle off all the ingredients, AND the order in which she mixed them into her recipe. It's honestly amazing what a 2-4 year old can really soak in, and I am SO glad we invested into this program. She just asked me this week if we can make pear tarts because she made them in class a couple months ago. Kids are like fabulous little sponges. Thank you for YEARS of fun, Peekadoodle! I'm so grateful to have had Maggie's most recent cooking class comped in exchange for becoming a Peekadoodle Ambassador. All opinions are my own, and I cannot rave enough about this program and this little school. Last night, I was thrilled to co-host the pre-opening event for Hanna Andersson in Corte Madera. The store is GORGEOUS, from the outside to every tiny detail inside. I definitely shouldn't have expected any different, considering their beautiful website. ;) The new store is having the BEST weekend deals, so if you're a local, GO! Snag some goods for the kids or the home!! Hanna is one of those brands that is really loved by the whole family (I'll show you in a few weeks how our baby boy is going to be loving his Hanna! Eeee, so excited!). The fabrics are soft and wash PERFECTLY. Hanna stands behind their products and allow lifetime returns because they guarantee good quality for every piece. With so many brands opting for 30 day strict return policies, this in itself is a breath of fresh air. My budget was happy that I didn't bring the girls-- they literally would have wanted everything in the girls' section! Plenty of kitty and fox prints that they would fall in love with, cozy and practical pieces that have that extra special something to make them appealing for kids too (like a great neutral cargo jacket for school, made extra special with stars and a pink patch! SO cute!). I could not step away from the accessories sections: knee highs with dots and stripes! crocheted necklaces, or shiny heart necklaces (like my friend picked up for her daughter-- doesn't get much cuter!). Their sweaters and colors are brilliant- everything a kid could want for their fall wardrobes. If you're not local, you can still shop your heart out-- online! I found my favorites for my kiddos (BELOW) -- soooo much cuteness, so much quality, and not too serious... Just like childhood products should be! !